The newspaper cutting (left) appeared on the front page of the Birkenhead News and Advertiser (Heswall and Neston edition) on 11 June 1960. John Lennon was given a copy of the article in 1964 and in several subsequent interviews referred to it as 'possibly' the first review of the Beatles ever. According to author Mark Lewisohn it definitely was. Asked by the unnamed journalist to list the most notable theatres they'd played to date the Beatles - John, and probably Paul (still going under the stage name of Paul 'Ramon' following their recent tour of Scotland with Johnny Gentle) mentioned the Manchester Hippodrome (1958), the Liverpool Empire (June 1957 ) and the Aintree Pavilion. This third venue has caused me no end of head scratching since I first read about it in Lewisohn's The Beatles Live! in 1986. There's no such place today and I could find no evidence to confirm that there ever was. It took the publication of another of Mark Lewisohn's books - Tune In - some 27 years later, to finally solve the mystery. Sort of. Mark now thinks the reference was a joke. A fanciful, made up* name for the Aintree and Fazakerley (pronounced Fazack-er-lee) Working Men's Social Club and Institute - the north Liverpool equivalent of Hambleton Hall in Huyton - a bleak little venue situated in Harradon Road which the late 1950s phone book says had a "pavilion", according to Lewisohn's impeccable research. The Aintree and Fazakerley Working Men's Social Club and Institute in 2014 (above) and as it today - The New Harradon Social Club (below). between 1957- 60. At this stage in their career this is exactly the sort of place where they could secure a booking (or more probably an "audition") but until any further evidence appears, which let's face it is highly unlikely at this point we'll have to mark it as "improbable". Aintree was a long way from where the Beatles lived in South Liverpool, and still is, but the area was familiar to at least two of them. Paul had family living not far away and George had watched the 1955 British Grand Prix at Aintree as a 12 year old schoolboy and again in 1957. From 7 January 1961 the Beatles would start making regular appearances at the Aintree Institute which sadly no longer exists. 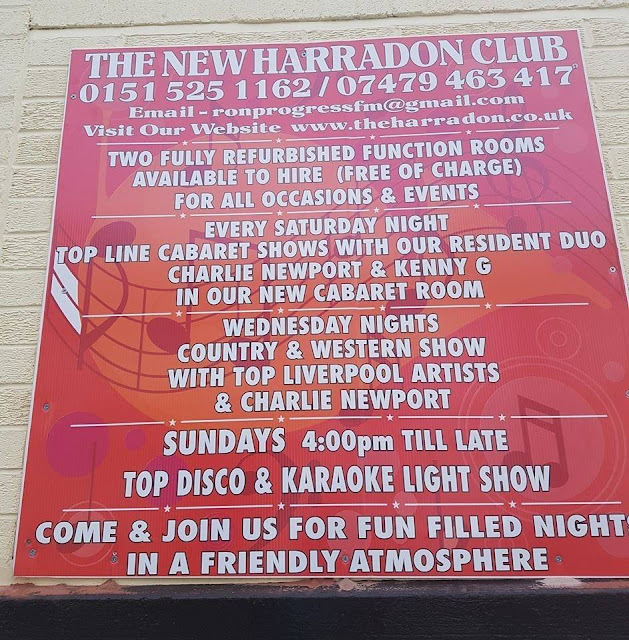 Indeed, as parts of Liverpool continue to be demolished on a regular basis the fact that the Harradon club is still standing was reason enough for me to make the trip to Aintree so I could include it here. Recently renovated externally and tastefully refurbished inside over the last couple of years the premises now operate as the New Harradon Social Club. * A name made up by the Beatles or perhaps the local nickname?